The Sedgwick County Courthouse (5SW.81) exhibits the vertical orientation and simple ornamentation representative of WPA Art Deco. The primary goal of the Works Progress Administration (WPA), one of many 1930s New Deal relief and recovery programs, was to put people to work. Most projects were designed to spend a majority of the funds on labor, not materials. Additionally, few projects used powered machinery in order to allow for hiring more men. Therefore, WPA buildings and structures in Colorado are marked by a high degree of craftsmanship, albeit untrained, provided by primarily unskilled labor. The quality of masonry work varies widely, undoubtedly reflecting not only different teams of workers, but also the growing skills gained by the men. The use of local materials in order to keep costs low is another hallmark of WPA projects. This resulted in some similarities of appearance within a region. WPA projects in eastern Colorado were simply designed, often by the local sponsor or occasionally by the regional WPA engineer. The buildings were influenced either by local traditions or were based upon contemporary styles. The favored contemporary style during the Depression years was Art Deco, which represented a complete break with the traditional designs of previous decades. Popular during the 1930s and 1940s, it is characterized by flat roofs with uneven cornice lines, stepped or set-back façades, a strong vertical emphasis and polychromatic materials. Stylized relief ornamentation was generally geometric and included chevrons, zigzag and geometric floral designs. In Art Deco examples built by federal relief programs, the stylistic details and form of the buildings are usually simple and restrained. 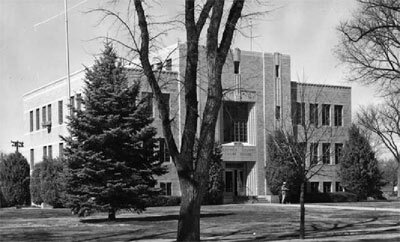 For further information about the architecture and history of the New Deal in Eastern Colorado, see the National Register multiple property document, New Deal Resources in Eastern Colorado.